"Finally! An online store / shopping cart that manages my advertising in Google!" "PrestoStore includes product ads in Google and Google Shopping... plus, help from real webmasters!" List an unlimited number of items for sale. No setup, listing, transaction or final value fees. Let us establish and manage your relationship with Google now! 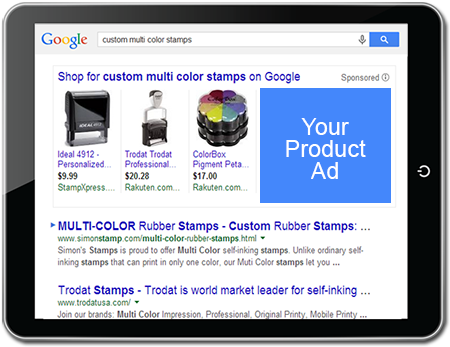 Your item details electronically communicated to Google advertising services for you. Our staff establishes and monitors a daily product feed to Google on your behalf. Your eligible listings appear in Google product ads and Google Shopping without paying extra fees. We establish and grow your search engine rankings using special webmaster tool accounts. Your web store automatically configured and optimized for effective search engine submission. Our staff uses Google, Yahoo! and Bing webmaster tools to place you in their search results. It's easy to setup your own PrestoStore! to answer your questions, seven days a week! Do you specialize selling a specific type of item? PrestoStore operates several "specialty marts", targeting the unique needs of your buyers. Visit actual PrestoStores maintained by our subscribers. Copyright © 2001-2019 PrestoBiz. All rights reserved.